Friendo #5 is out 3/27/2019. By Zack Quaintance — Let’s face it Friendo fans, this was never going to end well. From the start, Alex Paknadel, Martin Simmonds, Dee Cunniffe, and Taylor Esposito have been engaged in a deeply (and delightfully) twisted exploration of what becomes of the individual in a land where capitalism has thoroughly run amok. I mean, this is a comic where the first issue starts with our hero crashing a car and nearly breaking his body in the dual service of making a buck via something called ambush marketing and nursing his flagging dreams of fame. That same first issue also ends with that same hero getting stabbed by a seeming vagrant and then electrocuted back to life as the world burns around him. See? This really was never going to end well, like at all. I knew that going into this issue, and, frankly, I would have been severely disappointed if Friendo #5 had served up too much comfort, too much of a palate-cleansing happy ending. Thankfully, in this finale the book doubles down on what it’s been all about from its start. Paknadel and crew open up with a nod to the start of the first issue, to the throughlines about childhood and parenting and consumption that have pretty much lurked around the edges of the action throughout. For those who may not remember, before we get to the ambush marketing scene, we see our hero Leo as a child. His father is a zealous preacher, peddling prurient interests to disinterested surfers in Encinitas as his own ignored son peers through a toy shop window at the action figure de jour. The child, of course, asks his father if he can buy the figure with money he’s saved. The father takes the money, and shoves it in his son’s mouth. This finale lends new context to that story, opening with some wider media coverage that indicates those figures were eventually revealed to be toxic. It’s an interesting beginning, to be sure, a razor-sharp bit of storytelling that doesn’t telegraph its intentions for the audience, doing what the best fiction generally sets out to do, providing more questions than answers. From there we segue into our hero in the present. 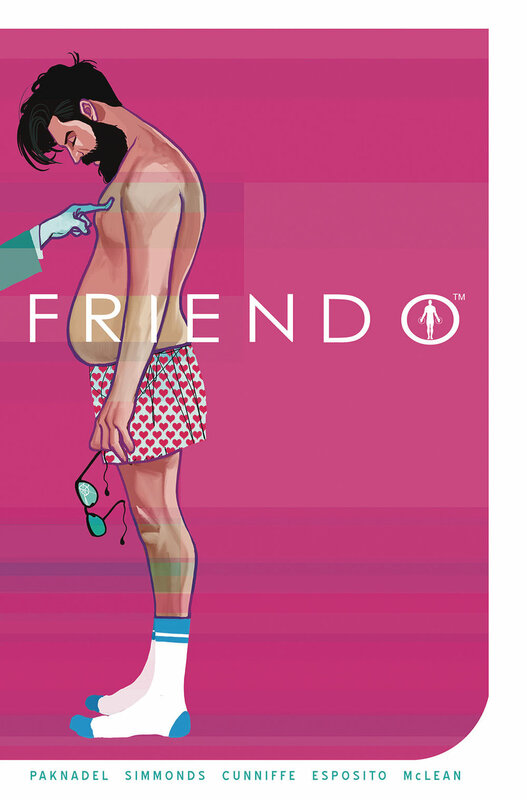 Like all the previous issues of this comic, Friendo #5 is expertly crafted in all elements from the artwork to the scripting. Simmonds and Cunniffe do incredible work. The concept of the finale is visually complex, and they turn it into as thought-provoking of an economic and cultural satire as it deserves. Starting about halfway through this issue, Friendo #5 is littered with imagery that will linger in your mind, all of it born from the rich thematic ground Paknadel’s scripting has sown throughout this story and all of it very much in keeping with the themes and tone of this book. This is a finale—and indeed an entire series—that will and should linger with readers for a long time to come. Just fantastic work all around.